Looking for the perfect gift for yourself or someone special? Our 14K Yellow Gold Hoop Earrings with Diamond Cut pattern are a must-have for every woman's jewelry collection. Fashionable and beautiful, these earrings are great for every day use. 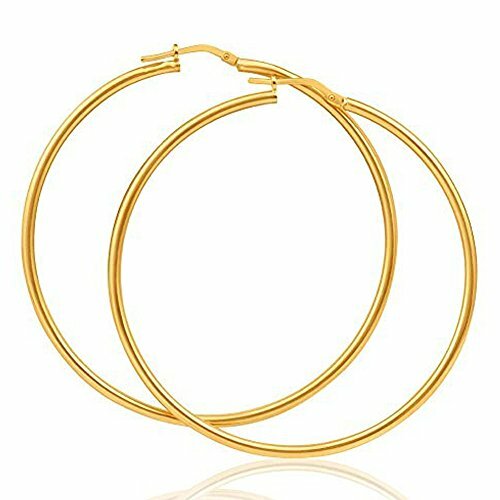 Genuine 14K Yellow Gold means these earrings will never tarnish. Buy them once and enjoy them forever! How many grams of gold are in these earrings? While each set of 1.25 in earrings varies by a tiny bit, each set will weigh at least 1.6 grams total. We always display the weight of our gold in our listings so you can be assured you are getting your gold for the most reasonable price on Amazon. How big are these 1.25 inch earrings? The earrings have a 1.25-inch diameter. They are 2mm thick, which is about the same thickness as a nickel. Who is Temecula Gold and Jewelry? We are a small, hometown store, whose owner/jeweler has over 30 years of experience providing trustworthy service to the community. What kind of customer service can I expect? Just like our hometown customers, your purchase is 100% guaranteed - if you're not satisfied for any reason, return it for your money back! Perfect womens jewelry gift for a wife, mother, grandmother, daughter, niece, aunt - or yourself! If you have any questions about this product by Temecula Gold and Jewelry, contact us by completing and submitting the form below. If you are looking for a specif part number, please include it with your message.